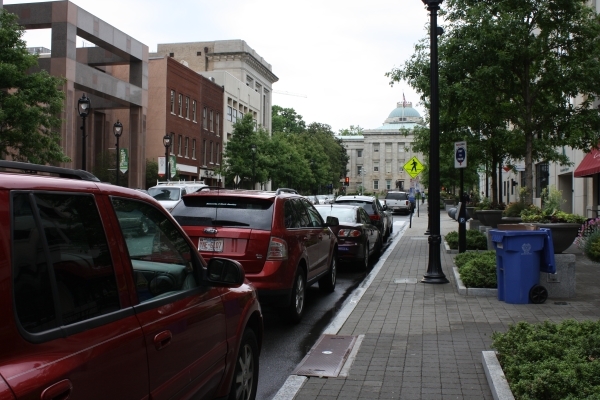 The Fayetteville District is the most desired on-street parking zone in the downtown area. 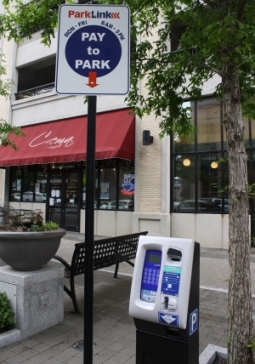 Councilors this week approved a contract extension with the company that maintains the city’s parking meters, but not without a lively discussion about the cost. The one-year contract with Duncan Parking Technologies will cost about $225,700 and will cover the maintenance and upkeep of downtown Raleigh’s 199 parking meters. The amount has increased each year since the first contract in 2011. Councilor Thomas Crowder said it seems like the city is paying a lot of money for the maintenance. Much of the increase is due to the city adding additional pay stations since the program started. City Parking Administrator Gordon Dash said the change also reflects a warranty service agreement that went into effect after the initial installation. The city paid a little more than $1 million in hardware costs to install the meters, which brought in $1.2 million in revenue last year. “If you look at just the cost of the hardware alone they were paid off in the first year and a half,” he said. The agreement costs the city about $85,500, but covers the maintenance and replacement of parts. For example, said Dash, in 2012 it would have cost the city $108,000 to replace 57 CPUs, plus an additional $108,000 for other parts, such as coin slots and credit card readers. The warranty service agreement covered those costs. The meters are susceptible to the weather, much like any machine located outside. Dash said that the agreement allows for some cost control and predictability. “Where it’s sitting at right now, I believe, is where it’s going to stay, so long as we don’t add more pay stations,” he said. Councilor Bonner Gaylord suggested the city consider technology, which is being used at his day job managing North Hills, that allows drivers to pay the meter by making a phone call, visiting a website or using a mobile app. He asked that the option be explored for next year. Dash has previously mentioned such technology as a future possibility. Raleigh City Councilors have put a vote for a new pawn shop on hold while city staff gather more information. City Manager Ruffin Hall asked that the vote be delayed while staff can compile more information about the request. Hall told the Record after the meeting that the police department wanted more time to research the applicant’s background. According to city documents, Tony Ro applied for a pawnbroker license in order to operate World Gold and Pawn in a shopping center on Chapanoke Road. The shopping center is located near Renaissance Park south of downtown Raleigh. World Gold and Pawn would be open Monday through Saturday and closed in the evenings and on Sundays. The shop wouldn’t sell alcohol, guns or operate check cashing services. The city received 40 emails asking for denial of the application. The Rite Aid on Capital Boulevard and New Hope Road was granted a variance that will allow the company to install a proprietary stormwater management device not approved by the state or city for use. Makers of the Filterra treatment system are in the process of getting state approval. The system would remove nitrogen on site without the need for buy-down credits. “This is a dry cleaner site with some contamination, so it limits and impact their ability to treat stormwater on site through traditional means,” said Stormwater Management Advisory Commission Chair Michael Birch. The variance would allow Rite Aid to use and install the device in such a way that it doesn’t impact the contaminated area while reducing the nitrogen level. Crowder asked that this case be used as a prototype to start collecting data — before the city sets a precedent by allowing these devices without data to back it up. Birch said the device will fall under the same maintenance and bond requirements as other stormwater management devices throughout the city. City Councilors unanimously approved the following road races. More details about each race can be found in the document below this story. Road closings and races are also listed on the city’s website. Date and Time: Sat. February 15, 1:50 p.m. – 3 p.m. Date and Time: Sat. March 8, 9 a.m. – 11 a.m. Date and Time: Sat. March 22, 7:30 a.m. – 10:30 a.m. Date and Time: Sat. March 29, 7 a.m. – 12 p.m. Date and Time: Sun., May 11 8 a.m. – 11 a.m. Date and Time: Sat. May 17 8 a.m. – 10 a.m. Date and Time: Sun. June 1, 8 a.m. – 5 p.m.